Legs: Spirit River Flex Floss White. Color with black marker. Cut in 3″ lengths. Body: Hareline Magnum Strips White and Grizzly cut to size. Head: Wapsi Flo. Orange chenille size fine. Glue: Zap Gel. Glue Rabbit strip tabs together and adjust legs for proper angle. Comb rabbit towards head to even out fur. Then blow back fur towards tail to get proper taper. 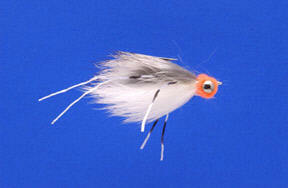 This fly has caught legal halibut, all size perch, corbina, and yellowfin croaker. The fly is available through Bob Marriott’s. Shops can order them through Umpqua starting May 2002.